While you want your wedding day to create a lasting memory that you will recall upon for a lifetime, this life changing event will come with quite the price tag. Over the years, you have probably noticed the cost of planning a wedding has increased significantly. This is making couples question if the high price is worth it. 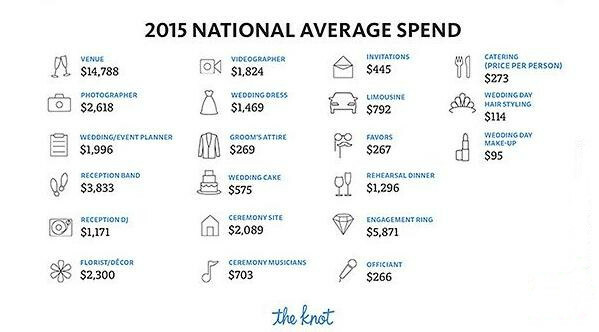 But wait, do you know well about what the average cost of a wedding is. When many couples sit down to calculate the general cost of their ideal wedding, they are often left speechless at the amount. In the US, the price of having a wedding can equal the cost of buying a new car or putting a substantial down payment on a new home. Based on studies of The Knot, this price just seems to be increasing each year also. In 2013, the average wedding cost was just $29,858, but in 2014, it had jumped to $31,213, and in 2015, it has reached $32,641, which didn't include the cost of the honeymoon. On the other hand, couples are just inviting fewer and fewer guests, comparing the increased cost. This wedding cost, however, will barely cover your wedding expenses if you live in New York or Chicago. As the two most expensive cities to have a wedding, the average cost for a New York wedding reaches well over $80,000 and in Chicago, you can be looking at spending over $60,000 for your wedding. On the opposite end, the least expensive state to have a wedding is Alaska, where couples spent just a little over $17,000 on their weddings. 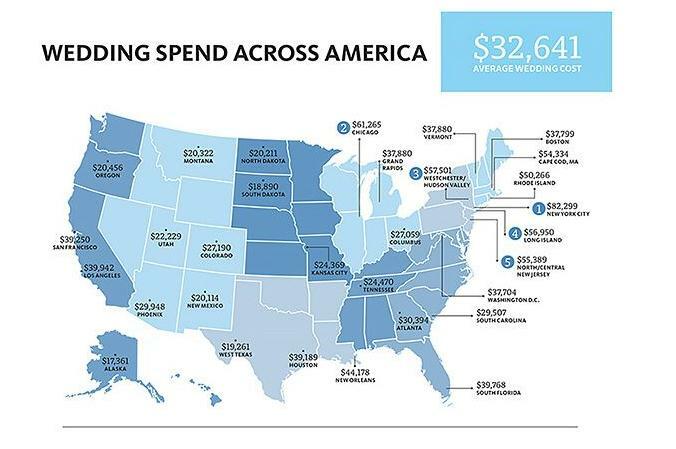 The map below breaks down what the average couple spends on their wedding by state in the US. With such a high price point, you may be wondering what the average cost of a wedding includes? Well, it includes all the wedding details such as reception and ceremony venue, catering, photographer/videographer, florist, dress and tuxedo, invitations, rings, hair and makeup, transportation and many other expenses that will go into most weddings. The honeymoon is not including in these average costs. Each of these individual costs is increasing on their own, which is what is contributing to the increase in the overall average cost. On average, brides will spend close to $1500 on their wedding dress and the engagement rings will carry a price tag of over $5,000. For a clearer idea of what each of these individual expenses will typically cost you refer to the picture below. The dates above are from The Knot without detailed info of 2016. You can click HERE to find average cost of a wedding in 2016 for references. While it can be discouraging to learn how expensive your wedding might end up costing you, there are a number of ways you can cut down on a lot of these expenses. Here are 20 ways you can reduce your wedding cost and still throw the wedding of your dreams. 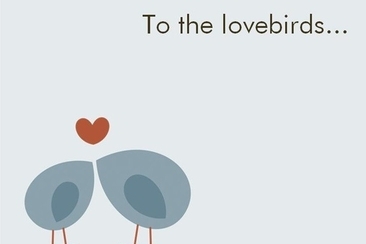 Saturday is the most popular day for couples to have their wedding on and will often cost more as well. 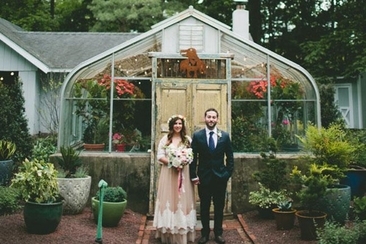 You can find a cheaper price on venues and rentals if you instead had a Thursday wedding. Friday and Sunday weddings can also offer a slight discount on the price. 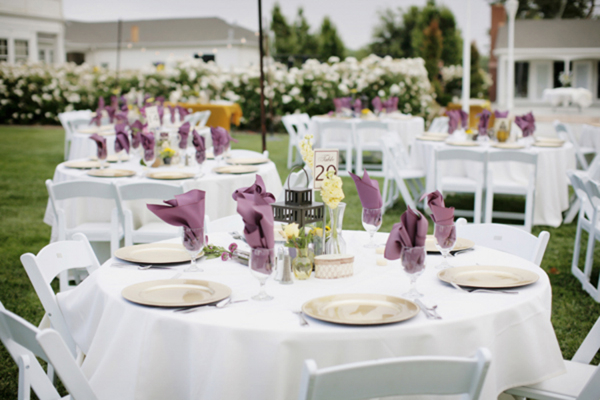 Look into having your reception and even ceremony at one of your local city parks. Most often these can be used for a much lower price and even for free. Many couples are choosing not to have a bridal party at all or just a best man and maid of honor. If there are more, this can add too much for your average cost of a wedding. The bridal party gifts, travel arrangements, hair and make-up and rehearsal dinner will add up to a few thousand dollars. Ask a friend to become ordained to officiate your wedding, which can double as their wedding gift to you. You can also ask you own church pastor to officiate for free and send the a special thank you gift after. 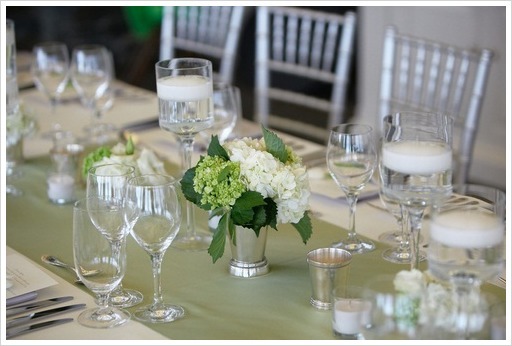 Instead of having floral arrangements on every table, limit them to just key areas where you know photos will be taken. You can also have the bridesmaids' bouquets double used as centerpieces after the ceremony. 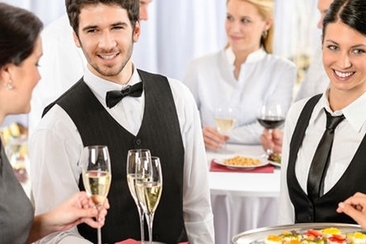 Even cutting just ten people from your guest list can save you close to $1,000! So look over your guest list and try to stick with just close friends and family. Remember to discuss this with your groom and both parents. It can be more cost efficient if you stick to a simple three-course meal instead of formal five course. This will cut the per person price, which will significantly reduce your overall dinner bill. Or just forget the sit-down dinner altogether and instead go with a buffet style option. This can still offer your guest plenty of food, and more variety while cutting out the server or staff fees. The wedding cake can add at least a thousand dollars into the average cost of a wedding, but this cost can be cut down a great deal by having one smaller wedding cake cut in front of your guest while having more sheet cakes to serve your guests. Renting chairs, tables, and a dance floor can take a good chunk of your wedding budget. If you are using an indoor venue, find one that will also be able to supply the table and chairs with no additional cost. Before you sign a vendor contract, make sure you look over it carefully and ask yourself if all the items included are necessary. Some venues will take out any labor cost for the set-up or breakdown of your event if you are willing to take on these duties. You may even be able to negotiate having the rental fees waived if you offer to do the setup and break down. Finding your wedding dress at a sample sale can mean a much smaller price tag, but be cautious with these types of sales. 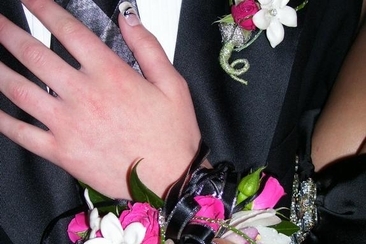 You have to consider the cost of alterations if need and dry cleaning if the dress has an odd odor or stain. Choosing to go with a DJ can be more budget friendly. 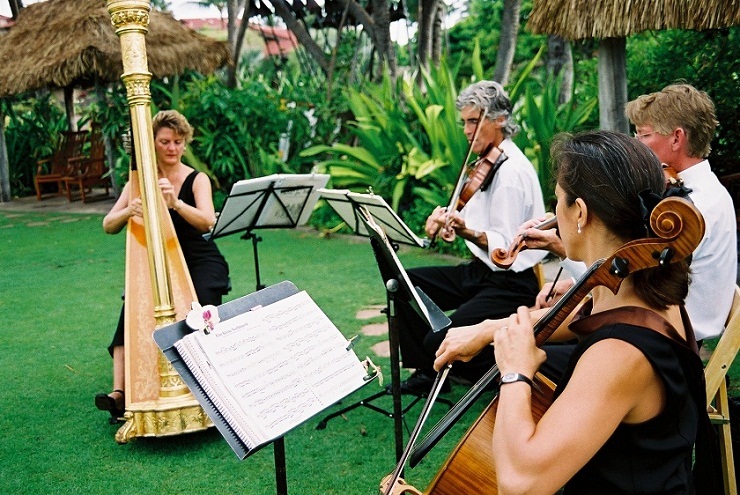 If you dream of having a band play at your wedding, limit the band members to only the necessary and consider using the band for only half of the reception. You can cut out the DJ or band fees by renting a sound system that you can hook up your own iPod to and create your own wedding day playlist. Friends and family can often help you cut a number of the average cost of a wedding. 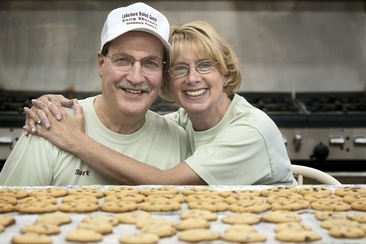 Ask your talented friends to photograph, help with invitation design or even bake the cake or desserts. This can be a way to save on a number of the decoration and centerpieces, but make sure you have time for these projects. Choosing to send your wedding invitation electronically can save you a lot on print and postage cost. Just make sure you have available email address to send your invites. If going digital with your invitation makes you shudder, you can still do a traditional budget-friendly invitation. Stick with simple black ink and avoid the square invitation. Make sure you know what you want to spend a little more on and what you can do without. List what are your top priorities to the lowest priorities and budget these items according to how important they are to you. Only have a $10000 wedding budget? Here are 8 practical ways to plan the perfect wedding with small budget like under $10000. Someone also shared their experiences.